The module uses an electronic circuit to detect when an electrically conductive object comes in direct or near contact with the capacitance "cap" input. A human, touching a metal button or approaching a metal sensing plate connected to the cap input, increases the capacitance between the module and a nearby earth ground. When the capacitance exceeds a specific level, the module circuit activates a transistor switch. A multi-turn adjustment screw on the module is used to set the minimum capacitance needed to activate the switch. When carefully adjusted, the unit will switch with only a small capacitance change. The module contains two switch outputs. The "momentary" output will remain activated as long as the sensor input capacitance is higher than the level set by the module’s adjustment screw. The "latched" output toggles the output on and off with each cap input activation. The module’s outputs can sink up to 1 amp of current and handle voltages up to 30v. 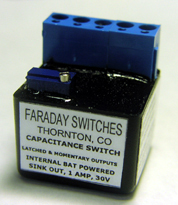 Faraday Switches use true capacitance sensing methods. Unlike some AC hum-type touch activated switch circuits, Faraday Switches do not require the area around the switch to be rich in line-powered-devices, such as fluorescent lamps. However, to insure reliable operations, an earth ground reference does need to be established. Each module provides a terminal for an earth ground reference. A 3V lithium battery internally powers FS3N-1 model. A screw terminal is included for an external battery or power supply connection. The unit can also be powered by a 3v-30v power supply. The external voltage safely overrides the internal battery. The FS3N-1 model has an extended 250pF maximum capacitance capability. This switch is ideal for applications with a large installed capacitance. The switch module is packaged in an epoxy sealed plastic box that is available with or without mounting feet. Standard barrier type screw terminals are provided to make all of the electrical connections. Dimensions are 1.0" x 1.0" x 0.75"